May 30, 2018 - It is said that if you want to truly understand somebody then you have to know all about where they live and where they come from. That is certainly the case with the Kalesnikoff family and the sawmill complex they operate on the bank of the idyllic Kootenay River between Nelson and Castlegar, B.C. Tucked away between the river and the highway and surrounded by mature fir trees, the mill blends into the landscape. In fact if you were driving by and happened to be looking the other way as you passed the main entrance, you might not even know there is a good sized mill there. This is the way the Kalesnikoffs like it, business and nature existing side by side separate yet bound together, the fortunes of each dependent on the prosperity of the other. If you have never been to the West Kootenays then you have never seen anything like it. There are three main cities linked by highway and rivers surrounding a large forested plateau, which is in turn surrounded by formidable mountain ranges. Because you don’t really need to travel through this area to go anywhere else, the region has remained an island unto itself. Things are done differently here, the pace of life follows its own Kootenay logic, people live how they want to live and for the most part, nobody worries too much when other people’s lives are much different than their own. They look after each other and are quick to give aid in times of crisis. The three different towns have very different ethnic populations, which quite literally gives the Kootenays a flavour unlike anywhere else. In short, it’s a wonderful place to live and it’s a perfect place run a sawmill in a way that not only works, but also feels right. The Kalesnikoffs are doing just that. 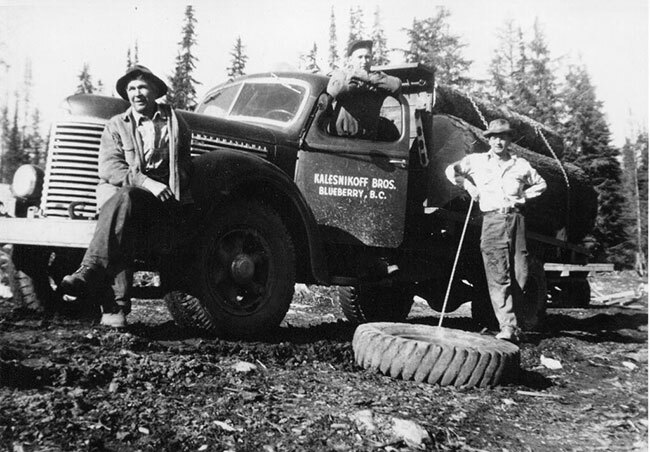 In 1939, deep into the Great Depression, brothers Sam, Peter and Koozma took a look around and noticed that there were people out making a living logging and milling lumber. Work was hard to come by and the boys knew they had to find a way to keep the family fed through those tough times. They picked up and a sleigh and some horses, hired a few friends and family and set out to build a sawmill. They built the first mill in Blueberry, just south of Castlegar. The mill sported a 48-inch headrig, and to supply the fledgling mill with lumber the family headed out into the woods. On Sunday night, workers would trek out to their bunkhouses in the forest and work all week until the flowing Saturday afternoon when they would return home for 24 hours of family and social responsibilities before returning to the woods to start the whole process over. One of busy workers was Peter’s son, Pete Jr. Pete was pulled out of school after Grade 5 to join the family business. The CEO, uncle Koozma, took a shine to young Pete, admiring his work ethic and natural business sense. Pete Jr worked his way up from the bottom to become sawyer at just 18 years old, and took over the company reins at 21. Not a man to put much stock in fancy business accouterments, Pete ran the entire company out of a milk crate under his bed, and by all accounts, did it brilliantly. With time the company flourished. They outgrew their location in Blueberry and so they set up in Robson, just a little farther north up the Columbia River. From there they built a mill on Mount Sentinel overlooking the city of Castlegar and following a large fire near the mill that very nearly took the life of Koozma (who saved himself and his team by leading them to safety down a mountain canyon), the company moved the mill to its current location in Thrums. The new mill could run four truckloads of logs a day, or about 120 cubic meters. They specialized mostly in timbers, cutting 6×6 and 6×8 in 18- to 24-foot lengths. Most of their product was sent back east for building “pole barns” It was around that time that Pete Jr’s son Ken graduated and came to work at the mill. Like his father, Ken also started working at the bottom, learning every aspect of wood production and had made it as far as sawyer when he was pulled into the office and set to work selling lumber. His first sale didn’t go so well. He was able to get a very good price for the order but when the time came for the customer to pay, he was nowhere to be found. But a lesson was learned and Ken kept at it, picking up management experience as he went. 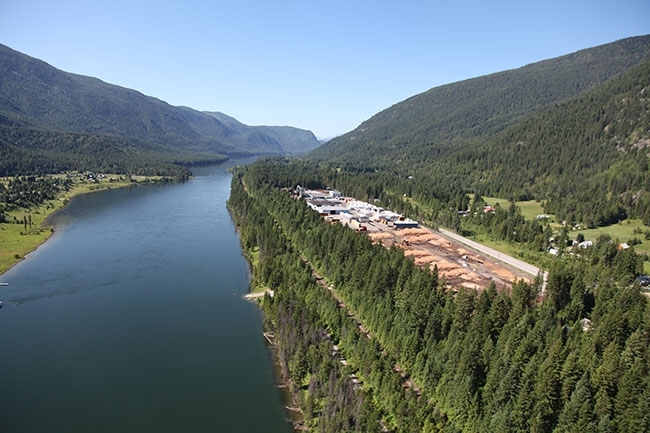 In 1998 after noticing that much of their lumber was being sold to reman plants, Ken saw the advantage in creating their own finished products and bolstered by a timber grant from the government, which was looking to invest in value-added industry, Kootenay Innovative Wood (KIW) was born just up the road from the main mill. In the beginning KIW targeted their products on the musical instrument market with very high quality spruce, tailor made for constructing pianos and guitars. While the product was top-notch, so was the competition and the company was unable to stand against foreign producers, which were able to sell the sought-after wood for less than the Kalesnikoffs could make it. After the aborted foray into the music-wood market and after a couple more false starts, KIW gradually perfected and increased their product line of high-end linear paneling, flooring, moulding and roof decking that they produce today. 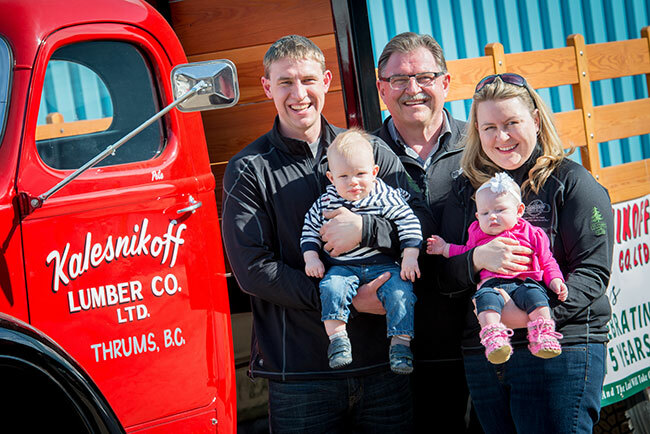 The Kalesnikoffs know that the reman market is fickle and ever changing so R&D and the ability to switch focus on very short notice has been key to their ability to retain their customers in a crowded competitive market. surrounded by mature fir trees. The family can trace the mill’s roots back to 1939. Photos courtesy of the Kalesnikoff family. Larger logs are sent through a seven foot long-column McDonough slivertooth headrig. The rig uses a Corely 20-foot, four bunk carriage that gives the mill the ability to run the longer timbers they are known for. In 2012, the sawmill received an upgraded canter line for the smaller logs. The new USNR canter uses a 21-inch roundsaw quad before feeding through a USNR shifting column double vertical arbor with the capacity for 13 saws up top, eight on the bottom and the ability to use either as needed. From there they go to either the USNR three saw board edger, the 10 saw trimmer or the McDonough 54 inch twin reman bandsaw. The Stetson Ross planer with its three custom splitting saws is central to the mills ability to produce the very high-quality lumber they market to Japan. The new machinery improved the mills recovery by 10 per cent, which in turn lead to more value headed out the door. Better data collection helps the QC team keep on top of changing conditions within the mill so that the quality of the finished product is as good as it can be. 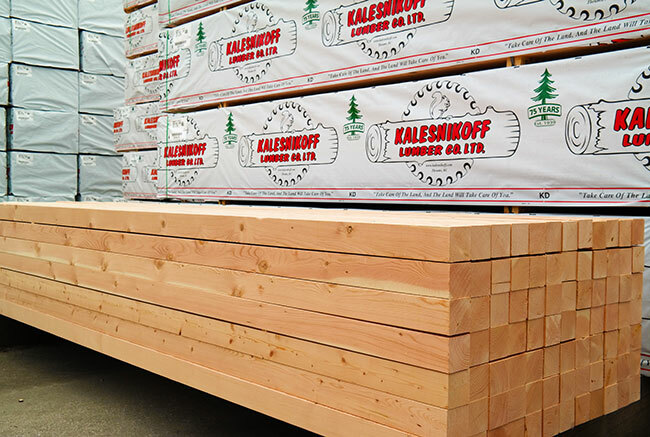 In addition to the best-in-class lumber produced for the Japanese post and beam construction industry, The Kalesnikoff mill produces specialty timbers that go to specialty markets all over the world. They also produce more traditional dimensional lumber, specialty products for the oil patch and readily take on custom orders, large and small. A portion of the mills production is earmarked for the KIW reman plant where value is added to the base product. A cornerstone of the Kalesnikoff legacy is their commitment to the surrounding community and to their employees. Pete Jr was a man well known for bonding with his neighbours and extended family. The mill contributes an average of $55,000 yearly to community projects and last year, for the second year running, the mill matched the donations of its employees in a drive to provide a full-service Christmas to local families in need. Together, they raised $13,000 and purchased food, decorations and presents for 40 families in the Castlegar and Nelson area. Knowing that Kalesnikoff lumber is not a large company makes the fund-raising of its 150 employees an impressive feat. Should an employee become injured, whether that happens on the job or at home, they can rest assured that a job will be found for them while they recover. An on-site masseuse takes care of the aches and pains of workers and the company provides flexibility in the form of alternate shift scheduling, recognizing that there is more than one way to get a job done and a happy employee is a productive employee. In today’s challenging business environment, competing with the large companies is harder than it’s ever been. It wasn’t very long ago that the big players didn’t bother bidding on the smaller timber lots but today, it’s all fair game. Kalesnikoff purchases 75 per cent of its timber supply on the open market and so the quality of the log diet to the mill has become very important. With that in mind, Ken finds himself spending less and less time at the mill, focusing instead on his involvement with the Interior Lumber Manufacturers Association. The ILMA is a collection of smaller lumber companies dedicated to making sure the right wood goes to the right mill. In other words, why send hemlock to a mill that specializes in Cedar or vice-versa? Why send high value logs to a mill that produces mass quantity commodity products? They believe that the end result of pre-mill log sorting would result in more jobs for B.C. workers and more diverse mix for the participating mills. Maximizing value from every log creates more wealth for more people and is a respectful way to use the available fibre.